What year did the speedo digital readout move from the tach to the speedo? I like the way it was in my '97 with the odometer at the bottom of the speedo and the digital speedo at the bottom of the tach. I suspect 2000 as my 2001 had the digital speedo in the "wrong" place. Unfortunately, a bit hard to see clearly, but my 2000 S with the speedo indicator in the center, below the tach, and the odometer to the left below the speedometer. This arrangement strikes me as the most sensible, since the move of the digital speedo indicator to the left in 2001 takes it out of the line of direct sight. ...The original was the "Purist" location. According to "Excellence Was Expected", the move was done to give the new trip computer enough space for all of its displays. purist only cares about rpm, not speed. that is, if you drive 10/10ths. Somehow I always see "Excellence Was Excepted." I must be a little dyslexic. 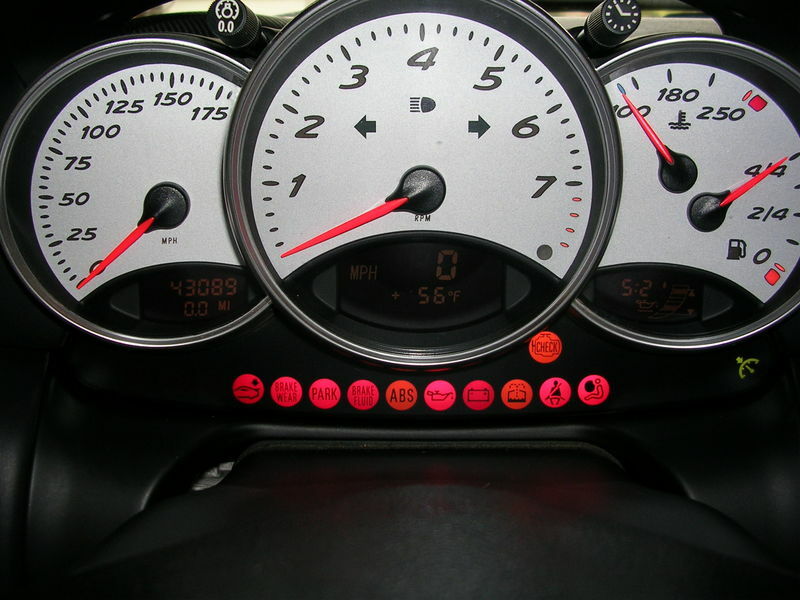 And I would prefer the digital speedometer to be in the center tachometer in my 2003. We all have our preferences. I find fhe analogue speedo completely useless. The digital one is more useful even with its inaccuracy. It should be placed on the tach gauge, in the middle position. On the street, I need to know how fast I am going. On the track, I need to see the tach. But even when tracking, sometimes it’s nice to know how fast I am going! As time goes on digital is replacing analogue and automatics are replacing manuals--A very unfortunate evolving transformation in Porches and other Sports cars. Apparently Porsche recognized their mistake in moving the digital speedometer as the 9x7+ cars have it in the tach again.